Sheriffs across the nation are coming together to defend our Constitution, laws, and rights. They can be very effective, especially when the citizens stand side-by-side with them and elect similarly committed county commissioners and DAs. 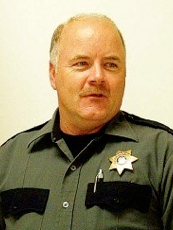 Jon Lopey is the sheriff of Siskiyou County. He is at the front line of insuring the Constitution and the laws are followed, and was the principle organizer of the sheriffs’ panel at the October 22, 2011 Launch. 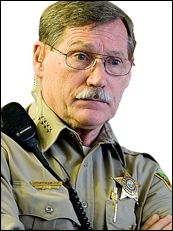 Glenn Palmer is sheriff of Grant County, Oregon. He is standing up for the Constitution, the law, and the rights of his county residents. His county faces a crippled economy, abuses by government agencies, illegal road closures, and more. Sheriff Mack rates him the best sheriff in the country. Richard Mack is a former sheriff of Graham County, AZ. 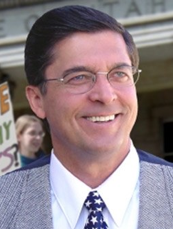 When federal agents came to him to enforce the Brady Bill, he sued the federal government and ultimately won one of the strongest U.S. Supreme Court decisions in support of 10th Amendment rights. He has been a tireless advocate of the role sheriffs can play in taking our country back. 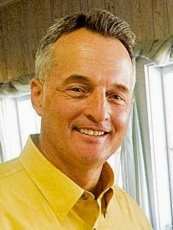 Gil Gilbertson is the sheriff of Josephine County, Oregon. A veteran of Viet Nam with some 36 years of distinguished law enforcement service, he is a strong defender of Constitutional and lawful government, including States’ Rights. Above: Eight sheriffs, and attorney Karen-Budd Falen, stand tall at the October 22, 2011 Defend Rural America launch to defend the Constitution. Above: Coverage of the October 22nd sheriffs’ panel. Above: Sheriff Tony DeMeo speaks out about defense of water rights. Above: 1st national meeting of the Constitutional Sheriffs & Peace Officers Assoc. Above: The first national meeting of the Constitutional Sheriffs and Peace Officers Association in Las Vegas, Nevada on January 30, 2012.